Matt Baker can't wait to get started as Ilkeston prepare for their first friendlies of the summer. Photo by Craig Lamont. Ilkeston FC captain Matt Baker says he’s excited by the upcoming season as the Robins prepare to get back into training this week. It’s been all change at Ilkeston once again this summer with new head coach Paul Holland appointed in May and several new players and coaches also having been brought to the club. And whilst that’s a situation that is very similar to this time last year, Baker believes there’s a different feel to the club on this occasion. He said: “Last year it was the case that everyone was new, from the vast majority of players right through to the coaching staff, so there was a lot more to get used to. “This time there are a lot more players who have stayed on and although there are some new signings too, I’m hopeful they’ll fit in really well, especially with two of them doing some coaching. “Also, whereas last year not many of us had worked with Gavin Strachan or Andy Watson before, this time we’ve got Paul Holland in charge who has worked with a lot of the younger players for a while and who even some of the older ones have worked with too. Ilkeston have announced an extra friendly which will now be their first of the summer, with Nottingham Forest U21s sending a team for a game that will take the format of three 30 minute periods. The game will take place on Saturday, July 9 and kick-off at 1pm, with admission being £5 for adults, £3 concessions and £1 for 13-16-year-olds. Under-13s are free when accompanied by an adult. That will then be followed by the Nottingham Forest first team coming to the New Manor Ground on Wednesday, July 13 for what will be new boss Phillippe Monatier’s first game in charge. 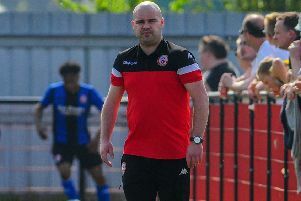 Baker, meanwhile, is expecting another tough season in the 24-team Evo-Stik Premier Division, with 46 league games plus cup commitments set to challenge the players on a mental and physical level once again. “It’s always hard with so many games but if you can have a good pre-season and make the most of the breaks between games, it can be manageable,” he said. “As you get towards the end it becomes a mental challenge too but how it affects you sometimes depends on how well the team is doing. “Last year was tough as we were struggling towards the end and had a lot of games to play, whereas the year before that we were in the play-off places and adrenaline took over, although I hadn’t played quite as many games that season as I did last year.